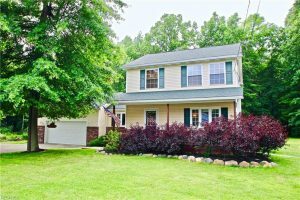 Beautiful oak trimmed Colonial 3 bedroom two and a half bath home on a cul-de-sac in Saybrook. Master bath with en Suite. Living room, dining room with french doors. Family room off kitchen with cathedral ceiling, skylights, bay window and french doors leading to a large deck. 2 car attached heated garage. Full basement with battery back up sump pump. Back yard mostly wooded with firepit for summer fun!